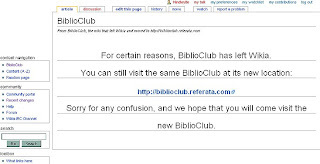 Something to keep an eye on over the coming weeks is BiblioClub's decision to leave Wikia. It's by no means a large wiki, but the resulting fallout is worth paying attention to. The official announcement was made on their blog on the 23rd March. Will the redundant Wikia be kept open or, due to its relatively small size, deleted? We shall see. Good luck, Biblioclub, we wish you a pain-free future away from Wikia. Thanks for the luck wish... I really didn't know that my wiki's leaving Wikia could actully have impact like this. You can find my latest work at http://books.referata.com. It is an update to BiblioClub. A floating reader? Join Illogicopedia!